Not my words. The actor, Steve Coogan’s. But they really resonate. I have become increasingly interested in love. As we go about the business of creating and encouraging change, what might happen if we put love at the heart of our practice. When many organisations have some pretty shocking and dehumanizing management practices, how can we counter those? In leadership and in organisational development, we often ask ‘what’s the difference that could make the difference?’ Could love – whatever that might look like – be the difference? Personally, I know that it can and does and I want to explore this more widely for organisations and leadership. One of things I noticed when I first starting talking about love is how many people didn’t like using the word. It felt as though they wanted to steer me onto safer ground. ‘You don’t mean love, though, do you? You mean compassion or empathy, don’t you’. No, I don’t, actually, I mean love. ‘Well it’s about engagement, I guess’. No, it’s about love, I guess. Why does it feel so uncomfortable? Do you find it uncomfortable to talk about love? I used to. But not now. 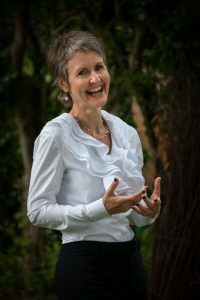 When I introduce myself to groups or, if a coaching client asks what approach underpins my work, I might say something about the principles of self managed learning or the important of including intentional practice. But I also often say something like ‘but I am increasingly finding it all comes down to love’. I usually notice a reaction of surprise. And then usually a curiosity, and a softening … and people often tell me that they find it surprising, but also human. And many people are interested in talking about it more. Having already completed a series of in depth interviews, the first stage of the research project was a survey of 75 leaders over the summer of 2018. Leaders from across all sectors. 55% either Director or at Board level. 34% from organisations with over 5000 people. I asked how important was leading from love and how comfortable they felt about the idea. I asked about what it could look like in practice and what could be possible if there was more of it. 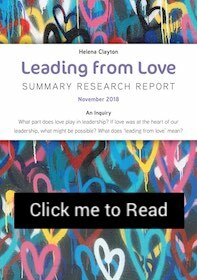 • why is love such a difficult concept to explore for leadership and organisations? • what gets in our way and how can we get around that? • and how can we start to release more love in our organisations? This is part of series of events, and I’ll keep this page updated with details of what’s coming up. • …and inviting you to join me by commenting, trying some things out, sharing your own examples and stories, and pointing me in the direction of other likeminded people. I’m looking forward to seeing what I learn, and sharing that with you. And please do forward this link and the research report to anyone else who might be interested. What might be possible if we put more love at the heart of our organisations? Could love – whatever that might look like – be the difference? Why is love such a difficult concept to explore for leadership and organisations? You can read more on this new project by clicking the image.